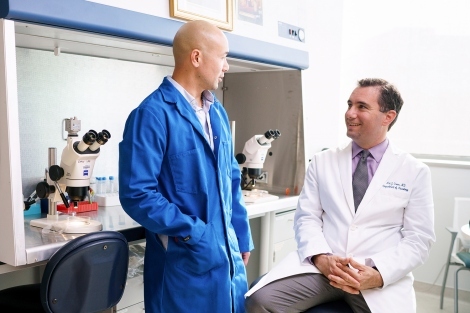 Jonah R. Chan (left), PhD, and Ari Green, MD, published a paper with results that show an over-the-counter drug restored nervous system function in patients with chronic MS. In a remarkably rapid translation of laboratory research findings into a treatment with the potential to benefit patients, UC San Francisco scientists have successfully completed a Phase II clinical trial showing that an FDA-approved antihistamine restores nervous system function in patients with chronic MS.
MS is an autoimmune neurodegenerative disorder that affects nearly 2.5 million people worldwide. The disease strikes when the immune system attacks myelin, layers of fatty insulating membrane that surround nerve fibers. Unlike the rubber insulation around wires, however, myelin helps electrical signals in neurons move faster and more efficiently. As myelin damage continues over the course of the disease, neurons progressively lose their ability to reliably transmit electrical signals, resulting in progressive loss of vision, weakness, walking difficulties, and problems with coordination and balance. Current MS treatments aim to prevent the immune system from doing further harm, but none have been shown to repair damaged myelin. In both his 2013 research and in subsequent studies with a mouse model of MS, however, Chan and colleagues had demonstrated that clemastine fumarate promotes myelin regeneration and restores neural function, promising preclinical results that inspired the new study, known as the ReBUILD trial. Because the visual system is often one of the first and most prominent parts of the brain to be affected in MS, and because there are well-established tools to measure the speed of neural transmission in the areas of the brain devoted to vision, the research team used a method known as visual evoked potentials, or VEPs, to assess clemastine’s therapeutic effects in the trial. The five-month Phase II trial enrolled 50 patients with relapsing but generally long-standing MS whose VEPs reflected preexisting deficits in neural transmission. The researchers showed flickering patterns on a screen to participants, and used electrodes placed over the brain’s visual areas at the back of the head to gauge how long it took for the flickering signal presented to the eye to generate an electrical response that could be detected by the electrodes. The time from presentation of the pattern to the detection of the VEP is a measurement of how long it took for the signal to travel via nerve fibers from the retina, at the back of the eye, to the visual areas at the back of the brain. To enhance the power of their study, the researchers used a “crossover” design: they divided the patient population in two and gave the drug, blinded to both participant and researcher, to one group, and a placebo to the other for 90 days; then they switched between the two groups, giving a placebo to the first group and the drug to the other for the next 60 days. This “flip-flop” technique gave the researchers the ability to compare patients to themselves – a form of control that increased the statistical power of the study by nearly an order of magnitude, Green said. During the periods when each group was taking the drug, the neural signal from the eye to the back of the brain was significantly accelerated over the baseline measurements taken before the patients began the study. The effect persisted in the group that had switched to placebo, suggesting that durable repair of myelin had been induced by the drug. Although the research team could not directly observe evidence of rebuilding of myelin in trial participants using magnetic resonance imaging (MRI), Chan and Green said that this reflects a weakness of current MRI techniques as a tool for this purpose rather than evidence that myelin regeneration did not take place. “We still don’t have imaging methods that have been proven to be able to detect remyelination in humans,” said Chan. That myelin increases the speed of neural transmission is one of the most well-established concepts in neurobiology, and combined with the clear evidence from Chan’s preclinical research showing that clemastine fumarate promotes myelin formation, myelin regeneration is the only plausible explanation for the VEP results, the authors said.